Gold Magic 12-10 Spiral Gold Panning Wheel Prospecting Recovery 12V Electric. Carry Bags, Pouches & Covers. Spiral Gold Panning 17 Spiral Pan with Built-in 12-volt Battery & Charger. Works in manual or battery mode. This gold panner can process 140 lbs of material every hour- allowing you to work more material faster, and recover more gold than ever before! Spiral Gold Recovery System Includes: built-in 12-volt battery, built-in 110 volt charger. Works in manual or battery mode, takes less than a minute to set up. Can process 140 lbs of material every 60 minutes. No need to screen the material first this machine will do the screening for you. Takes material up to 2 inches. In dry operation you will highly concentrate the material. It will take 140 lbs of material down to approximately 2 cups of concentrates in 60 minutes. Wet it will work the material down to clean good. The Gold Magic Spiral Gold Recovery System will allow you to work more material faster and recover more gold than ever before! This machine will work dry to highly concentrate material, and it will work wet in a tub to separate black sand and gold. And it can work right down in a stream to process material so you take home clean gold. Recovers all sizes of gold -- from flour gold to nuggets! Fine Gold Recovery from Black Sand. Lightweight and portable - weighs just 10 lbs. 17 inch diameter spiral pan with 69 agitation knobs. 140 lbs (two 5-gallon buckets) of material per hour. All components are designed for rugged outdoor use. The frame is made of marine-grade aluminum. The fasteners and pan shaft are made of marine-grade stainless steel. No lubrication of any part is needed. Only oil impregnated bronze bushings are used not ball bearings because they can seize up if black sand gets into them. The motor has a permanently lubricated, sealed gear case. The Gold Magic has a built in 110 volt AC/12volt DC charger inside the control box. Your battery should be fully charged when you receive it. The charger will recharge the battery in about 10 hours. There is a built-in control to prevent overcharge. The patented removable gold concentration cup allows you to pour your gold directly from the pan into your vial. 21 FAQs About the Gold Magic Spiral Panning Machine. Does Gold Magic include a battery? Yes; the Gold Magic Gold Recovery System comes with the battery and charger built in. Can Gold Magic be used dry as well as wet? 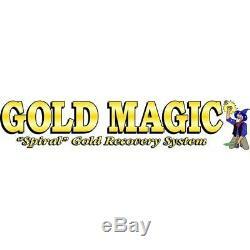 You can use the Gold Magic Gold Recovery System dry to concentrate. It will take a 5-gallon bucket of material down to about 1 cup of black sand and gold in 30 minutes. It can be used wet directly in a stream to process down to clean gold. The 1 inch wide spiral allows even large nuggets to be carried securely in the pan and brought up to the center removable cup. Does Gold Magic have agitation knobs? Yes; there are 69 located in the first 3 riffles of the pan (patented design). The Gold Magic Gold Recovery System uses only oil impregnated bronze bushings. It does not use ball bearings because they can seize up if black sand gets into them. How much material can the Gold Magic Gold Recovery System process? Approximately 140 lbs (two 5-gallon buckets) of material per hour. How long do the batteries last? Approximately 22-24 hours on a single charge enough time to work an entire weekend. What is the life of the battery? What is the life of the pan? Gold Magic pans are made out of an injection molded polymer so they are very durable. Does the Gold Magic Gold Recovery System need a pump? Because of the new innovative design, no pump is necessary. And since you don't need a pump, you have higher gold recovery and a lighter weight machine and no downtime trying to unclog the pump and spray bar. Does it come in a box? The Gold Magic Gold Recovery System is designed to be used in the field. Just put the unit in the stream and use the water available; no need to lug water anywhere. Does the Gold Magic Spiral Panning Machine have a hole in the center? No, the pan is sealed. There is a removable center up in the center of the pan. The pan is sealed so that everything stays on the face of the pan. Nothing is hidden behind the pan, and if you do forget to put your cup in, your gold is still there on the face of the pan to be recovered. Do I have to screen material first? The Gold Magic Gold Recovery System is the only self classifying machine on the market and can take material up to 2 inches in size. How much does it weigh? Total, including the complete machine with battery and charger. Is it easy to carry? The Gold Magic Gold Recovery System is designed to fold up and be easily carried with one hand. Does it have a variable speed motor? Years of product field testing has determined that a variable speed is not necessary. What percentage of gold can be recovered with the machine? In practical tests using a variety of sizes of gold and using basic dirts, it is about 90-95% recovery. Is the angle of the pan crucial? The Gold Magic Gold Recovery System starts at about a 45 degree angle and you can adjust it from there. Since not all material is created equal, you can adjust the angle to do the best job considering the type of material and gold you are working with. How is the gold and black sand separated? No spray bar is used. Instead, you will use a very gentle rinse method that will allow even the finest micron gold to move up into the center cup while washing away the black sand. How big is the Gold Magic pan? Is the Gold Magic Gold Recovery System easy to use? All it takes is about 5 minutes of training. It's very easy even kids can learn to use it no kidding! In fact, folks with disabilities use this equipment because it is easy and light. Small-scale commercial operations use it because it is fast and efficient. And tens of thousands of recreational gold prospectors around the globe use the Gold Magic Gold Recovery System for all of these reasons and more! The old adage that "Gold is where you find it" is not necessarily true. Prospecting in the better known gold bearing regions will immediately improve your chances of finding gold. Gold is where others have found it and you have come up with a better method of recovering gold. That better method is your Gold Magic®. Your Gold Magic® spiral recovery system is light weight and folds to a small size for easy storage. Always keep your Gold Magic® with you while traveling in your car, RV, boat or airplane, for opportunities come when you least expect them. RIVERS & STREAMS Rivers and Streams become natural collectors of gold, making it a little easier for the average prospector. Gold moves and collects primarily during flood stage. The high fast waters cut away at the banks of the river and carry the gold into the mainstream. Gold being seven times heavier than most other materials will tumble along the bottom of the river and easily come to rest when the current slows along the inside bend of the river or hits a major obstacle such as a boulder. LAKES During the summer months the water in many lakes recedes making the lake shores easily accessible. While exploring the shoreline, look for streams that may still be flowing and dry washes that may only flow during heavier rains or spring run off. Prospect thoroughly where the stream enters the lake. If you find any color at the mouth of a stream or dry wash, chances are there is more gold further up the stream. Here is where the wet and dry capabilities of your Gold Magic® shows its value. You can work wet in the lake or streams and in a few minutes work dry without changing equipment. DESERTS AND DRYWASHES With your Gold Magic® working dry, you likely have your first opportunity to effectively prospect in the totally dry desert regions. Even though these areas are dry most of the time they do quite often receive torrents of rain which cause flash floods, developing into rapid rivers which easily erodes the soil along the river banks. When these rivers recede, the dry river bed is commonly referred to as a "dry wash". Looking for gold in a dry wash is a lot like looking for gold in a river except you have better access to all areas of the dry wash. Look for bedrock and crevices in the bedrock. Remember gold only moves during flood stages and tumbles along the bottom because of its weight. In doing so the gold will lodge on or in cracks of the bedrock. Also look for large boulders that may be firmly anchored in the wash. When the flow of water is disrupted around the boulder, the gold will settle at this spot. A common practice is to place a cargo strap around a boulder and roll it over with the use of a come-along or winch on a 4X4 vehicle. Once the boulder has been moved you can process the material that was around and under the rock. If you can't move a particular rock, be sure to get at the material around its edges. A dry wash may have 10'-20' high sidewalls. Explore these walls for veins of black sand and crevices where gold may have lodged. WARNING: Always use caution when moving large rocks or boulders. CULVERTS AND GOLD Culverts under roadways are a natural trap for gold. The corrugation of the galvanized sheet metal causes a slight turbulence which causes the gold to settle. Process the material collected in the first 3-4 feet of the culvert opening. A plastic gutter scoop which will contour to the shape of the corrugation works well for removing material. Also check the area to the right, left and below the entry of the culvert. A wide flow will strike the culvert abutments and cause the gold to drop at the mouth. GROUND HOGS AND GOLD Ground hogs, in search of food and establishing habitat, dig large caverns as deep as six feet below the surface. The materials they dig up will appear as large mounds on the surface, often with a ground hog perched on his hind legs nearby. These ground hogs are little gold miners; process what they have piled up. If you find some gold, keep processing until you're done then cave in the hole. The next time you are by, there will likely be a entirely new mound to process. It is common knowledge that the largest strike ever discovered was the Comstock Lode and it was a result of ground hogs digging. TAILINGS FROM OLD MINES Our early prospectors and miners did not do a very thorough job of recovering gold. In addition when a big strike was made, the general belief was that there was no end to the amount of gold available. These factors contributed to a great amount of gold remaining in mine tailings. You probably already know where there is an abandoned mine. You can recognize them by the tailings lying on the hillside. You can check with the Bureau of Land Management or Bureau of Mines for more information regarding mines. WARNING: Mine shafts are dangerous! Stay away from any openings. These tailings can be processed wet or dry just as you find them. If you find a good producer you may want re-establish the claim. Recovering Gem Stones Using your Gold Magic® Spiral recovery system, you can recover your heavier gem stones (sapphires, rubies, garnets, emeralds, diamonds). To recover gem stones, set up your Gold Magic® following the instructions for wet separation of black sand and gold. Tilt your pan to a 30 degree angle. It will take about 2 to 3 minutes before you start to see the gem stones moving up into your center cup. Do not rinse the center cup. As you do to recover gold, this will wash the stones out of the cup. When your cup is full, stop the machine and remove the center cup. Have a dark colored plate or tray available. Pour the contents of the center cup into the tray. Your gem stones will sparkle and you can pick them up with your fingers or with tweezers. Pour your concentrates from your tray into a small container. When you are all finished run your concentrates again. Be sure you watch your center cup. Usually when you are working material for gem stones you will also find a little gold. If you see gold, rinse your center cup and recover your gold. Listings for USED Items / Auctions. You have nothing to lose! 3901 Bestech Road #100 Ypsilanti, MI 48197. Opening hours: Monday through Friday 8:30AM 5:00PM. Our reason for being is to help You find the Best Metal Detectors and Accessories that fit Your specific needs. It's simple, we say NO to junk and make your Metal Detecting Experience GREAT. With Serious Detecting you know you will get high quality products and service without compromises. 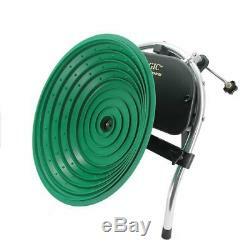 The item "Gold Magic 12-10 Spiral Gold Panning Wheel Prospecting Recovery 12V Electric" is in sale since Tuesday, June 3, 2014. This item is in the category "Consumer Electronics\Gadgets & Other Electronics\Metal Detector Accessories". The seller is "serious_detecting" and is located in Ypsilanti, Michigan. This item can be shipped to United States, Canada, United Kingdom, Denmark, Romania, Slovakia, Bulgaria, Czech republic, Finland, Hungary, Latvia, Lithuania, Malta, Estonia, Australia, Greece, Portugal, Cyprus, Slovenia, Japan, China, Sweden, South Korea, Indonesia, Taiwan, South africa, Thailand, Belgium, France, Hong Kong, Ireland, Netherlands, Poland, Spain, Italy, Germany, Austria, Israel, Mexico, New Zealand, Philippines, Singapore, Switzerland, Norway, Saudi arabia, Ukraine, United arab emirates, Qatar, Kuwait, Bahrain, Croatia, Malaysia, Chile, Colombia, Costa rica, Panama, Trinidad and tobago, Guatemala, Honduras, Jamaica.